Judas Priest frontman Rob Halford vows that upcoming album Redeemer Of Souls is so "relentless" that even fans who were disappointed with their last record will love it. 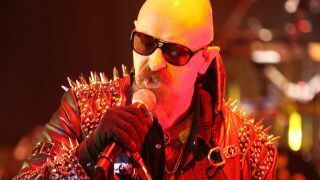 Their 2006 concept release Nostradamus saw them stepping away from their trademark sound – but Halford says it was essential to do that in order to be able to make what will be their 17th studio outing. Halford tells Eddie Trunk (via Blabbermouth): “We realised the record really had to be strong, full of energy. The tracks are relentless – the energy you feel off Redeemer Of Souls is replicated time and time again. “If you look at bands of longevity like Priest, you see the trail of music we’ve left. I don’t think we could have made as great a record as Redeemer if we didn’t have Nostradamus as a reference point. Guitarist Glenn Tipton reveals they were so determined to secure the relentless vibe that they relegated five songs they liked to bonus tracks on the deluxe edition. He explains: “They are all great songs. The reason they are not on the album is because the 13 that we chose are very consistent with what we wanted to do, which was release an indisputable heavy metal album. Meanwhile, Tipton hints that despite Priest’s Epitaph world tour having been their last on that scale, they’re planning to hit the road again. Redeemer Of Souls is released on July 14 in the UK.